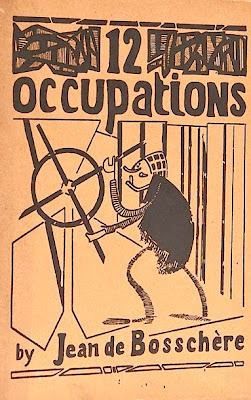 Jean de Bosschere, 12 Occupations, trans Ezra Pound, Elkin Mathews, Cork Street, London, 1916. Collectors of early modernist literature are well aware of the rarest of Ezra Pound’s first experimental ‘ imagist ‘ poetry (Lustra, A Quinzaine For this Yule etc ). But this little pamphlet, a translation of an early work by the Belgium poet and artist Jean de Bosschere is so scarce that it doesn’t even get a mention in The Young Genius, 1885 – 1920 (2007),David Moody’s monumental first volume,. Nor does it feature in other collections of letters from Pound. However, in the recently published letters to his parents, De Bosschere’s name does crop up several times, though I cannot find a mention of 12 Occupations. Did the translator see it as mere hackwork done to pay the rent of his bedsitter in Kensington ? It seems possible. He must have done a good deal of this sort of thing at the time. Pound was a famous talent-spotter and De Bosschere was just the sort of multi-talented. artist/writer that he would have nurtured. Having, in 1900 graduated from art college in Antwerp, De Bosschere paid several visits between 1901 and 1905 to Paris, where he met writers interested in the occult. From 1905 he seems to have supported himself as an art critic until the outbreak of the First World War, and during this period became an admirer of symbolism and of the mystic Catholic writer Paul Claudel. In 1915 he fled the Great War for London where he met, not only Pound, but also fellow Imagist poets like Richard Aldington and John Gould Fletcher, as well as D.H. Lawrence and Aldous Huxley. His own first collection of poetry ( Beale- Gryne ) had appeared in 1909 and he continued to write poetry and novels throughout his life, although possibly because most of the latter were seriously weird, they remained unpublished at his death. Knowing that Pound was the go-to man in London, the Belgium showed him his work( presumably both his writings and drawings )in 1916. At first, Pound didn’t know what to make of it. , but felt ‘there was something or other figiting around in his carcass, trying to get out in expression‘. De Bosschere himself was a great admirer of the drawings of Lewis and Gaudier. Pound did however submit the Belgium’s verse to Poetry and De Bosschere in turn wrote a critique of Pound for The Egoist. In 1917 De Bosschere’s persistence was rewarded when he received a three year contract to illustrate books for Heinemann, including works by Ovid and Wilde.In the following year Pound reported that an exhibition of De Bosschere’s paintings was coming on in the West End. By 1920 Pound had become a great admirer of his graphic art and the two men met occasionally in Paris. By means of the table, he brings the food half-way to our mouths. For the table is the first floor of the earth, as heaven is its garret. Oh, admirable work of this man, which delivers the featherless biped from the animality which lives on the earth. The Greek has not done better for our sublimity. God knows what Pound thought of the whole undertaking, though no doubt he was glad of the money. For some reason, his name does not appear anywhere in the book, but I doubt if he minded. There is no mention in his letters home of any fee, nor how well the little book sold. Although 12 Occupations has always been regarded as a rarity in America and the UK, in Europe they get far less excited about it. In 2006 a copy appeared at auction in France with an estimate of 20/50 Euros. In February 2012 Bloomsbury sold a similar copy for £260. 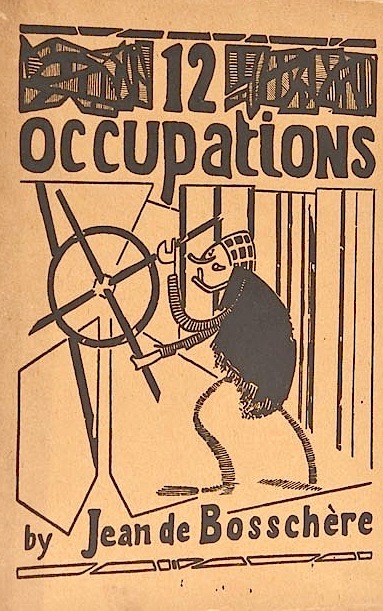 The 12 Occupations currently with Peter Harrington at an eye watering £2,250 is signed by the author, who has also hand coloured some of the illustrations. Oddly, on 11 Oct 2012 at Swann Auctions in NYC a dummy version, possibly from the publishers’ archives, made $3120 with a copy of the trade edition. The latter may be the one that Zubal are offering, because it wasn’t there when I first looked a year or so ago. Bookride has long had a quarrel with those Books on Demand publishers, with good reason. A few years ago they were as mild irritation that got in the way of the ‘ real ‘ book on Abe. They could be annoying, but you tolerated them. Today the situation is very different. They seem to have taken over the whole of ABE like some giant pulsating fungus out of Quatermass, or those giant PODS from ‘ The Invasion of the Body Snatchers ‘. If this expansion continues they will push out all the real books, just as the replicated human clones from the pods pushed out all the real humans in the film. Did I say ‘will’? In some cases they already have. Take the other day. For some reason I decided to check out copies of Ackermann’s Repository of the Arts—a publication venerated among design historians and for that reason famously expensive. Less than two years earlier, not long after I had bought a respectable 1809 volume from a bookstall in Ripon market for a bargain £5, I discovered half a dozen good copies at the usual inflated prices of £200 or £300 a piece. When I entered the book title again, there they were, the book clones. I scrolled down until I had gone through the whole list—not a single real copy of the real Repository could I find—all were Repressed Publications/Kessinger/Nabu clones. Then it occurred to me. Had I and other innocent seekers after real books been responsible for all those other alien life forms that were taking over the world of real books ? Was it possible that whenever an ABE user signals an interest in a particular (often rare) title this triggers a mechanism that registers this interest and relays it to a BOD publisher, who then reproduce it as a POD book ? How else can you explain why so many titles I have enquired after on ABE have soon after appeared as POD books? . Surely too, is it no coincidence that the rise of the POD has coincided with the rise of the postgraduate degree scam, which itself is partly a way by which the polytechnic-turned –universities raise funds, possibly for their crappy libraries? 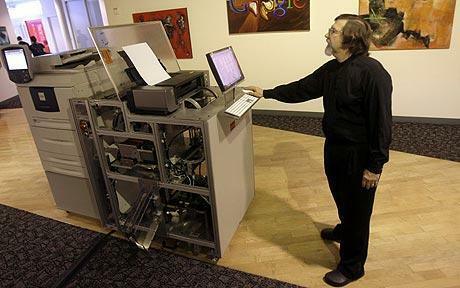 I suppose it could be argued that if you are only interested in acquiring the text of a book, perhaps to aid your postgraduate research, the cost of a POD would be cheaper than paying for a visit to the British Library, if you live in Plymouth or Newcastle. But in the end, if demand for personal copies of rare texts continues to increase there is a real danger that dealers will be discouraged from advertising their copies of these ‘real ‘books online, for fear of having them swamped by the clones. In addition to the Repository, I’ve looked up other titles that I used to see on ABE, and these too seem to have disappeared. Also, bizarrely, some PODS now cost more than the ‘ real ‘ books that they reproduce. I’d like to quiz Mr Kessinger and his friends about their sales figures. How many PODS do they sell? After that I’d like to meet some of those who have bought PODs of titles that are available as real books, either online or in the hundreds of second hand bookshops that, despite the Internet and Kindle, can still be found throughout the UK. Have they looked for these titles in these bookshops? If not, why they have rushed into buying a grubby little computer generated body snatcher of a book, barely held together, with misprints, a meaningless cover and smudgy illustrations, for only a little less, in some instances, than the real thing, which they could have had if they’d looked a little further or waited a little longer. It all reminds me of people who will gladly spend more on a reproduction of a Georgian dining room table in perfect condition than they would on an identical table in the same saleroom that happens to have slight wear. These people are fools.